Cineplex Digital Solutions (TSX: CGX) this week announced the introduction of a new Digital Hoarding offering that revolutionizes traditional static signage on vacant storefronts in shopping centres and retail environments. A plug-and-play solution that is installed in mere hours without disturbing on-site construction, Digital Hoarding turns a blank space into an engaging and interactive experience that gets guests excited about what’s to come through customized content and gamification. CDS’s Digital Hoarding features large touch and gesture-enabled screens that can be fully customized, allowing shopping centres, retailers and brands the opportunity to connect digitally with guests like never before. In addition to interactive screens, Digital Hoarding solutions also have photo capture capabilities, on-screen content manipulation technologies, couponing and gamification, social media connectivity and participant data capturing. CF Markville in Markham, Ontario is the first shopping centre in Canada to utilize CDS’ exciting new Digital Hoarding solution. Its deployment includes two interactive screens deployed across the mall to drive guests to the Express Eatery via mobile couponing. Once there, digital hoarding provides activities and games designed to increase dwell time in the mall’s food court as well as provide a digital entertainment experience for its guests. Digital Hoarding has a 98” landscape screen that delivers two customized interactive experiences that have been optimized to provide consumer insight analytics. Top Shopper – A fun and fast paced game that involves product icons falling on-screen. Visitors must add the icons to their shopping bag while avoiding obstacles. 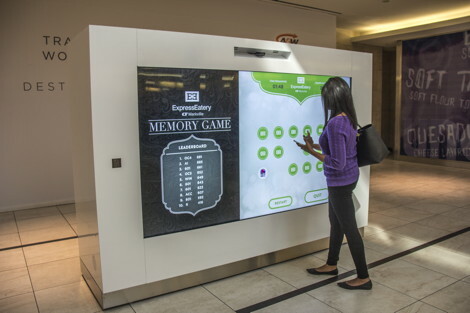 Match by Memory – A two-minute memory challenge that has visitors use the touch screen to flip over as many matching customized cards as possible before the clock runs out. Match by Memory cards have been customized to the logos of the participating tenants located in the Express Eatery. Both experiences are equipped with a leader board to entice guests to return to the Express Eatery to play for the highest score. Several senior execs from Cineplex Digital Solutions including Fab Stanghieri will be on hand at The DailyDOOH Investor Conference next Wednesday during New York Digital Signage Week for those wanting more information. This entry was posted on Tuesday, October 27th, 2015 at 16:29 @728 and is filed under DailyDOOH Update. You can follow any responses to this entry through the RSS 2.0 feed. You can leave a response, or trackback from your own site.